Nukewatch’s book is available here, now for only $20! To order via mail, please download and mail the tri-fold brochure or contact Nukewatch. Regular cost is $20 with free shipping. Wholesale rates are available for orders of 10 or more copies. Contact us for shipping rates outside the United States. Read a review of Nuclear Heartland by Women Against Military Madness (WAMM) here! 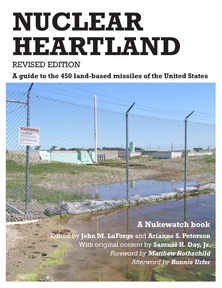 Watch Nuclear Heartland USA below– Video of Nuclear Heartland Book Presentation by Co-editor John LaForge. Video by Vic Sadot for the BFUU Social Justice Committee.